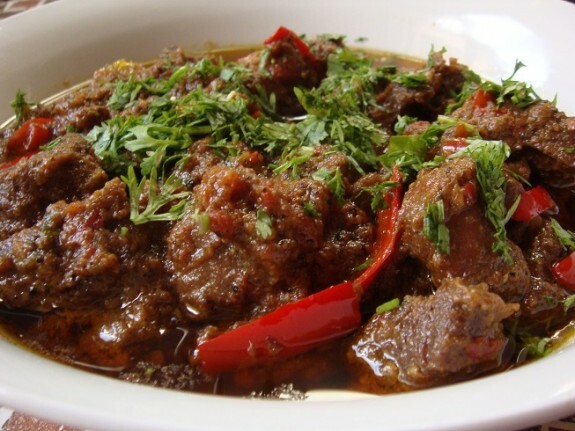 Mouth watering beef karahi prepared in traditional Pakistani style. A dish consisting of fried beef with tomato gravy and spices. Take a wok and put beef, pieces, yogurt ,red chili powder ,salt, all spice powder and ginger garlic paste. Cook it on a low flame. While the meat is cooking grind whole coriander ,white cumin and black pepper corn. When the water in beef dries add chopped tomatoes and ground spices. Cook till beef tenders then add oil. When the oil comes on the top sprinkle lemon juice, garnish with chopped ginger, chopped coriander,and chopped green chilies.